Going down the rows, it's always a matter of life and death. Life, if we're planting. And if we're weeding - well, these weeds must die! 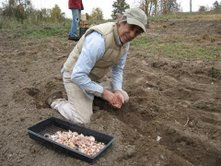 So planting garlic on a beautiful fall day is a matter of life, but also a matter of faith. Like penitents of old, we crawl down the rows in service to our task. Heads down, each clove we gently push into the soft ground a prayer of hope and survival. For those tiny cloves, planted in October, will barely sprout before the winter freeze arrives. They must hold that faint memory of life through the dark, still season. In spring, when air and soil temperatures conjoin to beckon the sprouts from their cold cradles, tiny green shoots will appear where frozen ground had recently been. By harvest time in July, a field of large lush fronds will wave in the breeze, ready to continue the cycle. So the garlic does have to "die" in order to be plucked from the growing ground, dried, and head toward our spaghetti sauce. But within each bulb of garlic that we harvest, lies the seeds, or cloves, that we will plant to continue the circle of life. Such is the responsibility and opportunity, curse and blessing, burden and gift for the grower - nose down in the dirt of life and death. Garlic was the last crop that Ken King planted. Just back from his diagnosis, hopped up on steroids, Ken wanted to get back to work. 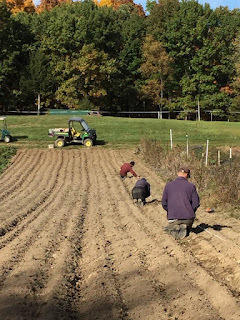 It was October; the garlic was being planted. Did he know he wouldn't live to see it harvested? Maybe, maybe not. Did it matter to him? Nope, not at all. He was back in the dirt, and that was all that mattered. Planting on faith - life or death, life and death, all one. 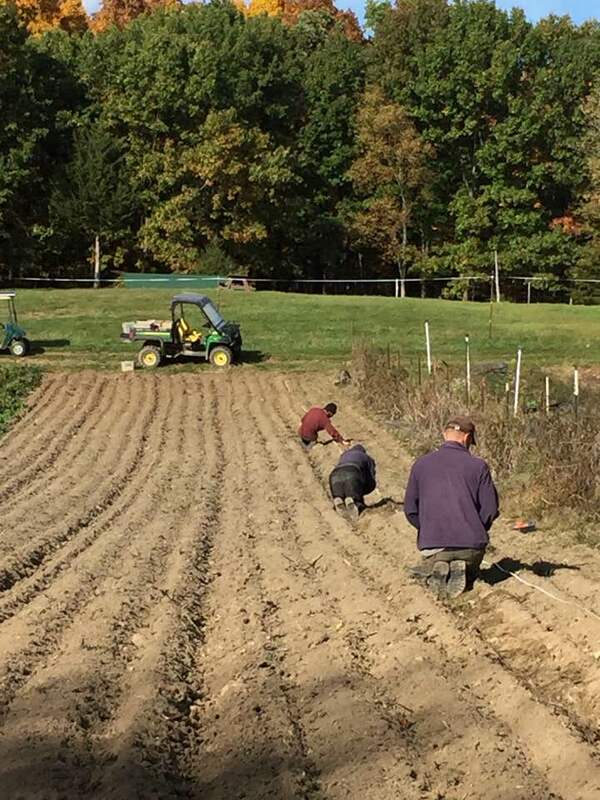 Kenny, Billy and Edwin King planting garlic. I graduated from Michigan State in 2010 with strong passions for local organic food, community development, and a healthy (or maybe unhealthy) fear of not making enough money in the career path that I would eventually be forced to choose. The looming decision often weighed on me heavily as my inner self struggled to put a value on working with my passions vs. working for a salary. Towards the end of my college career, I spent weeks toiling over the situation. After contracting shingles and likely straining many of my interpersonal relationships, I still felt as if I had not made any progress in terms of knowing what was right. I eventually decided that I would “sacrifice” a year in order to pursue work that I really loved before zeroing in on a more lucrative desk job. I was lucky enough to find a dream job in my hometown of Ann Arbor working for Avalon Housing in coordination with Growing Hope on gardening and nutrition education for low-income Ann Arbor residents. I loved my work, but at the end of my first year I decided to pursue a career in Investing. I studied hard for a certification test that helped me to gain credibility in the industry, and eventually landed a job working for a small, family owned wealth management firm in Bloomfield Hills. After buying fancy clothes and trying out a new hairdo that I copied from my dad, I began commuting again, this time an hour by car instead of bike. In many ways I felt like I had taken a 180 degree turn, from socialist to capitalist. I still managed, however, to hold on to some parts of my past life that I held dear. Every week I would bring in my CSA share or maybe some wild black raspberries to pass around the office, though many of my colleagues were afraid that I was poisoning them. I would talk about how you could eat weeds, and how much I enjoyed the trees in the office yard. It was about five months into the job when everything took a turn for me. My boss offered me and my coworker tickets to the suite at the Tigers baseball game. We happily accepted and spent the evening enjoying food and drinks while we watched pitches from padded chairs, and talked to industry veterans. Towards the end of the game, we decided to take a walk around the park for the last few innings. As I finished a conversation with a sailor and his family that had started after I complimented his extraordinary beard, I turned around to see that my friend was gone. I had left my cellphone in the car, and so had no choice to make my way back to the parking lot. The game hadn’t finished, so I decided to take my time. I strolled along the concourse and out through the tall green gates that protect the stadium from dangerous outsiders. I made my way down the sidewalk outside and approached a man sitting on the ground, leaning against a streetlight. He was not far from my age, and as I moved closer I could hear the jingle of a few coins coming from the bottom of the foam cup that he clutched in his hand. Suddenly my mind was consumed by the fact that I had never really tried to understand or get to know someone who was in a position comparable to this man. I sat down next to him and found that he was rather eager to talk. I carefully probed into his life, wondering about his likes, dislikes, family, and more. He told me he was homeless, and was a native Detroiter. To me it seemed that he was a fully capable individual; able bodied, sharp mind, and good communication skills. I decided to ask him why he was begging for money instead of working a job that would allow him to provide a little more for himself and live what to me would be a more comfortable life. I was completely taken aback by his statement. I sat dumbfounded as he went into detail about his Christian beliefs and how a strong faith had been so important to him. I eventually thanked him and walked away as the idea of a happy crack-addicted homeless man sunk into my naïve consciousness. “That was amazing!” I said. I don’t know if I could have described the experience any better. And just before I could say anything, a young girl, maybe six years old, ran up and put a dollar in the man’s cup. “I don’t even care about the money! Nobody ever listens to me! Thank you so much for listening to me!” The man exclaimed. I looked at him and saw him wiping away tears that were streaming down his cheeks. I couldn’t believe what I had heard, or what I was seeing. I looked at him and thanked him from the bottom of my heart. He told me that the song was from West Side Story, and we exchanged exclamations about how amazing life can be. I left him with a huge smile on my face, knowing that something special was happening within me. As I looked at all of the people around me, I began to truly see the fallacy in the belief that material goods would lead to happiness and comfort. The men I had talked to had not only been more or less penniless, but they were surrounded by people with money and privilege. Yet, they were both so happy. I could almost feel my money-related fears exiting my body as I walked out of the shadow of the stadium lights. I thanked him for talking to me and wished him luck. I was completely humbled. I went to work the next day just like any other day, except that I couldn’t help but continue to replay the conversations that I had had the night before in my head. Over and over I thought about these men who I would have looked at before as having nothing, and thinking about how fulfilled and happy they were. I finished out the week in normal fashion, but something in me had changed. By the end of the weekend, the seeds that had been planted in my head had begun to grow. I got both of my parents and my sister together and explained what had happened and how it had changed my view about money and what I now believed lead people to happy lives. I told them that I had been afraid of so many things, and that I somehow wasn’t anymore. While I think they all had been happy, proud, and comfortable in my career choice up to that point, I think they all knew that my true passions may have lain outside the world of finance. I told them that I was going to think a little more about the situation, but that I thought that my heart might not be in investing, and that maybe food and community development were my calling. I went to work Monday morning and began looking through my emails as I normally would. Within 5 minutes of being there, the two young brothers who owned the firm said that they wanted to meet with me in the conference room. The younger brother began “Paul, you’ve been here for about 5 months now. You have gotten a good feel for what we do, and we have learned a lot about you too. First off, we wanted to both say that you have done a wonderful job here, and that we wouldn’t be the only ones to say that we enjoy having you work here. But, we have also noticed how passionate you are about food, farms, and the environment. Any free time you have, it seems like those things are on your mind, and you are excited about them!” The corners of my lips began to creep up ever so slightly as I tried not to smile too much. I exited the meeting feeling so amazed about life in general. I packed up my stuff and sadly said bye to the many friends that I had there, though more than excited about my fresh, fearless new life path.